Dubrovnik, Kotor, Budva, Split, Plitvice Lakes, Zagreb, Ljubljana, Bled, Postojna, and more! Spectacular natural scenery, historical sights, exciting cities: this is what await you on this fantastic Gay Eastern Europe Tour, across Croatia, Montenegro and Slovenia. Yes, take in all the key sights of these beautiful Eastern Europe countries in just one amazing trip with us! 10 days / 9 nights of exploration of the best these neighbor countries can offer. Croatia is a unique destination with a glorious 1778km-long coast and a staggering 1185 islands. We will start the tour from the city of Dubrovnik, in the south, a jewel in itself known as the 'Pearl of the Adriatic' for its stunning beauty. 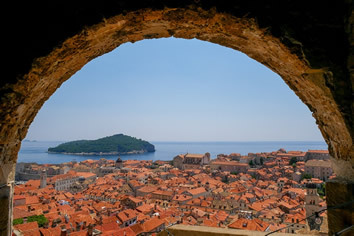 Dubrovnik is the best-preserved Croatian medieval city and the liveliest in Dalmatia. 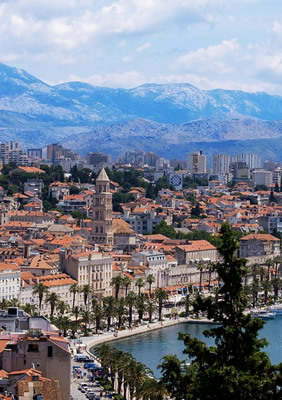 From there we will make our way north, along the Dalmatian coast on the Adriatic sea, to our second stop, Split. This is a picturesque ancient port city with a lovely castle. This city was the hometown of the Roman Emperor Diocletian: Diocletian’s Palace, one of the world’s most impressive Roman ruins in existence, is a UNESCO World Heritage Site not to miss. 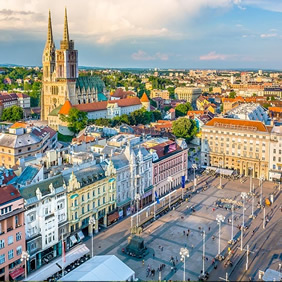 Third stop of our Gay Eastern Europe tour will be the capital of Croatia, Zagreb. Zagreb is a medieval yet modern European town with many different opportunities for everybody. We will finally make our way to the last stop of this amazing journey: Liubljiana. Slovenia’s capital and largest city is one of Europe’s greenest and most liveable capitals: the perfect city to finish our amazing Gay Eastern Europe Tour. You will meet like-minded gay men from all over the world on this all gay tour. Book now as spaces of this once-in-a-lifetime trip are limited! 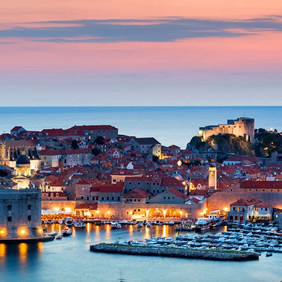 Welcome to Dubrovnik: Famous for being the filming location for the iconic Game of Thrones series, the city has such unsurpassed beauty you’ll never get enough of. Make your way to your accommodation, smack bang in the centre of the city and settle in. Here you will meet your hosts and get your Gay Eastern Europe Tour welcome pack. Join your fellow Gay Travellers and your tour host, Sergio in the evening for a Complimentary Welcome Dinner. Here we will all get to meet each other and have a full briefing on the adventure that lies ahead. After breakfast we embark on a city walking tour of Dubrovnik’s Old Town, a UNESCO World Heritage Site. This is the perfect way to get to know Dubrovnik: we will visit all the best attractions of this charming seaside city, from the City Bell Tower to the Assumption Cathedral, the Rector’s Palace and the Church of St Blaise. Free time in the afternoon to enjoy lunch and stroll around Dubrovnik as you wish or take a siesta. Today we will spend a full day exploring Montenegro, getting to know the historical heritage of the Bay of Kotor and Budva. We will explore the city with a professional guide and admire gorgeous architecture of Baroque and Venetian periods. Montenegro is a small and picturesque country filled natural beauty full of charme and interesting towns. Free time in the morning to enjoy once more some of the beautiful sights of Dubrovnik at your own pace. In the early afternoon we board on a ferry along the Dalmatian Coast ready to make our way to the second stop of our tour, Split. After breakfast, we will take part of a tour of the amazing Old Town of Split. We will meet our guide outside the Diocletian Palace and then head inside to discover the delights of its incredible ruins. Now a UNESCO World Heritage Site, the palace was originally built as a lavish home for the Roman Emperor Diocletian, but became more like a city in its own right as more buildings were added to it throughout the ages. The rest of the day will be free for you to enjoy the sights of the area at your own pace. If you want to continue exploring the surrounding area you can embark on a tour of the coastal inlet of Trogir — sandwiched between Croatia’s mainland and the island of Ciovo. Once surrounded by city walls, Trogir’s historical center has been awarded UNESCO World Heritage status in recognition of its architecture that dates back to Hellenistic times. Later, we invite you to join dinner in one of the typical restaurants of the old town. 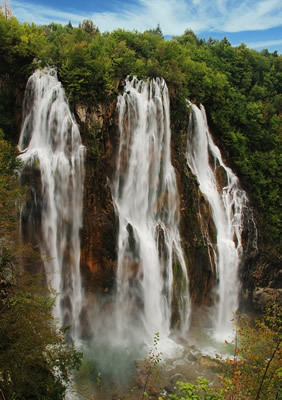 After breakfast the group will join a tour of one of the most suggestive natural areas of the world: the 16 lakes and waterfalls of the Plitvice area. Our first stop – about an hour up the coast – is a dramatic viewpoint above the charming village of Skradin, on the Krka River where it meets the sea and in the distance, surrounded by Krka National Park. After our short stop, we’ll head up through the countryside towards a unique jewel – the Plitvices Lakes. We will spend the full day in the area, before returning to Split. After breakfast we take a Fast Train that brings us directly into the Capital City of Croatia: Zagreb. Check-in at the hotel and enjoy lunch on your own. In the early evening we will join a guided walking tour of the city. We will enjoy a stroll through the city parks to get to know the most famous buildings in the town and their historical significance. The romantic Zrinjevac park, King Tomislav Square, green oasis of a botanical garden in the city center, Croatian State Archives and the magnificent Croatian National Theater of Zagreb are just some of the sights on this easy, evening walking tour. Our local and professional guide will introduce us to the most interesting facts about each of them as well as their role in the past and today. After breakfast the Gay Eastern Europe Tour will board on a train to reach the final stop of this amazing trip, Ljubljana. After check in into the hotel and lunch on your own, we will embark in a walking tour of Ljublijana. Ljubljana is often called a European jewel or described as a small blend of Prague and Amsterdam. It is a ‘town with a soul’, as visitors often comment. This vibrant old town is concentrated along the Ljubljanica River, and the castle on a hill still looks like it is protecting the romantic city below. The tour is on foot because it is much easier to get around Ljubljana’s pedestrian Old Town. Despite the fact that it is a capital city, it is easily walkable. You will see all the major sights in Ljubljana including the main square with the Prešeren monument, Franciscan Church and Three Bridges, Congress Square (Park of the Star), the National University Library, Križanke Monastery, the New Square, the Cobbler’s Bridge, the Old Square (the oldest street), the romantic river promenade, the Municipality Square, St. Nicholas Cathedral, the famous Open Air Market, Butcher’s Bridge, and Dragon Bridge. 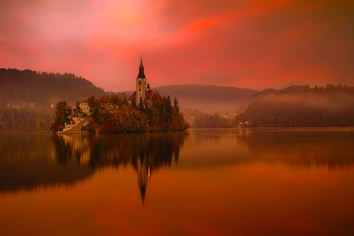 Just 45 minutes north of Ljubljana, there lies the magical Alpine resort, Bled with its magical lake. We will ascend the old castle, perched on top of a steep cliff above the lake, and take some time to enjoy spectacular views of the surroundings from the castle’s terraces. A boat ride on a ‘Pletna’ – a traditional boat made by locals – is mandatory when visiting Bled. We will reach the only true island in Slovenia, ring the ‘fortune bell’ and soak up the sun, peace and fresh mountain air. Then it’s time to head south to discover the mysteries of the Slovenian karst in the Postojna cave. The guided tour of the cave takes you on a ride by electrical train and a walk through the beautiful passages and chambers with spectacular drop stones, pillars, limestone curtains, and other extraordinary wonders of the underground world. 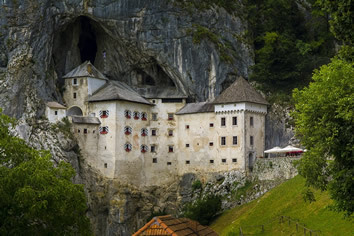 We will continue to the idyllic village of Predjama where we will enjoy the medieval fairytale of the amazing Predjama castle, the largest cave castle with its dramatic setting in the gaping mouth of a cavern half-way up a hillside. Learn about the legend of a famous knight, Erasmus – the ‘Slovenian Robin Hood’ and other local folk traditions before heading back to Ljubljana. In the late afternoon we will then make our way back to Ljubljana, in time to get ready for our farewell dinner. After breakfast it’s time to say goodbye! This amazing Gay Eastern Europe Tour is over. No tears please! You can make your way to the airport or extend your stay either in Ljubljana or take a train to explore Venice. We can help you plan your stay. 9 breakfasts and 2 dinners included. Paying a single supplement is not required. We will try to match you with a roommate if you are traveling alone and prefer to share a room.